Fibre Channel SFP: Why Fibre Channel? With the advent of SFP transceiver communication, there have been many different standards. In network hardware, the advantage of SFP transceivers is that they allow a single device, such as a switch, to support different cabling and transmission formats. However, when you try to find out which optical transceiver type you need, you will encounter problems. Because there are several different types of fiber SFP that can support a variety of communication standards, such as CWDM/DWDM, SONET, fibre channel, Fast Ethernet, and Gigabit Ethernet. Today we are going to introduce fibre channel SFP. Fibre channel is a protocol mainly used for “storage area network”. Fibre channel speeds are different, ranging from 1, 2, 4, 8, 16Gbps to 128Gbps. Fibre channel is a lossless protocol developed when switches are not as reliable as they are now. When using Ethernet as a protocol, frames are discarded, which brings problems to applications such as data traffic. With the development of technology, switches are now becoming more reliable. However, fibre channels still have a small advantage over Ethernet in terms of consistency and latency. What Is Fibre Channel SFP? 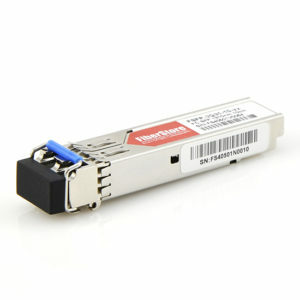 Fibre channel SFP transceivers is an important device for connecting fibre channel networks in data centers. It provides an interface between fibre channel system and SAN optical fiber. Fibre channel SFP transceiver is a common module in storage area network (SAN), which can provide 1, 2, 4, 8, 10, 16 and 20Gbps data transmission rate. Fibre channel SFP transceiver can be used for single-mode and multimode fiber applications. Fibre channel, as a set of advanced data transmission standards, allows large amounts of data to be reliably moved at thousands of megabits between computers, servers, disk arrays, and other devices. Fibre channels are chosen for high-end storage connections because they have three main advantages: high speed, proven reliability, and guaranteed ordered packet transmission. High speed: The original version of the fibre channel runs at the maximum data rate of 1Gbps. Now it can run at the rate of 128Gbps. Proven reliability: fibre channels were initially accepted by almost all the world banks, Fortune 500 companies, and other organizations. These enterprises and organizations needed reliable and timely data transmission no matter how much it costs. Nowadays, the reliability of data transmission is still crucial. fibre channels are the most reliable for any enterprise or organization. Moreover, the choice of the fibre channel is not expensive. Guaranteed in-order delivery: Fibre channel ensures that the raw block data is transmitted sequentially. Sequential delivery greatly improves network efficiency and is required by some applications, such as video streaming and IP streaming. Fibre channel naturally streams video frames sequentially, eliminating the bottleneck of reorganization. Otherwise, the frame speed per second required for video will be reduced seriously. In summary, the advantages of fibre channel are still abundant, such as fast speed, reliability and sequential delivery, which is why we advocate fibre channel SFP. You can find high-quality FC SFP on FS.COM, such as 2G/4G FC SFP, 8G/10G FC SFP + module. Besides, we can also supply Gigabit SFP, 40G QSFP+ and 100G QSFP28. We offer a full range of branded and reasonably priced 100% compatible transceivers to meet your business need. This entry was posted in SFP/SFP+ and tagged fiber sfp, fibre channel SFP, gigabit sfp, optical transceiver on August 27, 2018 by Admin. What Is IGMP Snooping and IGMP Snooping Switch? What Is an Optical Cable and Why Do We Need It? Why Choose 10 Gigabit ISCSI Switch for SAN?